While inspecting a 127 yr old commercial building in Missouri Valley I saw some real “artwork”. 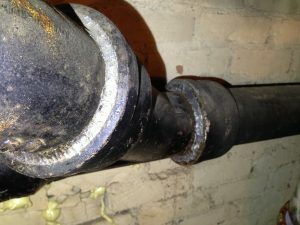 We still see a lot of cast iron sewer lines, however these had recently been resealed with the traditional lead/oakum seals. It has become very rare to see this dying art practiced, due to the dangers of working around molten lead.